We Ship From Stock Within 5 Days! Our "In Stock" Program means your selection from this group will ship in 5 days of less. Why wait. Call now. Ergonomic engineered products with expediency. Standard credit policies are in effect. Model CPB - The Complete Packing Bench for your Mailroom, Shipping Department, or Office. 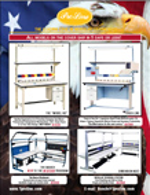 All of our in stock workbenches are available with ESD laminate work surfaces and ground kits, for In Stock ESD benches look for the suffix C at the end of the part number. We start with a top quality product at the core of your Ergonomic Workstation - one of our superior workbenches. Then you select the specific attachments and accessories you need to get the job done - You Customize Your Choice . . .
A wide selection of Accessories and Optional choices, and Riser Shelves are stocked to outfit your workstation. Shipping In Stock Inventory in 5 days or less. F.O.B. Haverhill, Massachusetts. Made from Steel (not aluminum). Look at the shipping weights on our products. No lightweights here. No materials shortcuts. Rolled Front Edge: 90 Degree Post Formed Front Edge, Upcharge is added to Price of Base Model Workstation. Add "PF" to part number ordered. We introduced our first workbench in 1978 and work hard to preserve our position as the Leading Edge in Modular Ergonomics. You can get your order Fully Assembled or shipped to you knocked down. Let us know your preference. One saves freight, one saves time. Any Questions? Phone, Fax, E-Mail, or drive by - we would love to help you.